I was reading about the discovery of vast amounts of water locked up in ringwoodite (see here). The authors of the study seem to suggest that previous ideas, involving water deposits being delivered by comets, were brought in to question by the ringwoodite discovery, and that this water was there from the Earth's formation. Is there no means through which such a large volume of surface water, perhaps delivered by comets, could be subsumed in to the mantle through tectonic processes? Definitely. This was happening throughout most of Earth's history, it's happening now, and it will happen in the future. Recent research shows that not all water is lost. Some of it may actually survive the way down deep into the mantle. The identity of the carrier minerals and the exact conditions are still a field of active research and new discoveries are constantly being made. This would most likely form water-rich and water-poor regions in the mantle. The water content of the mantle will thus be quite heterogeneous, which raises the question of how representative was the ringwoodite discovery. After all, it's only one data point. So to summarise it, yes. Water from the surface can end up in the mantle. This doesn't necessarily mean that this is what is happening, and it may be equally likely that the mantle water is indeed primordial. Not the answer you're looking for? Browse other questions tagged geochemistry planetary-science water tectonics mantle or ask your own question. 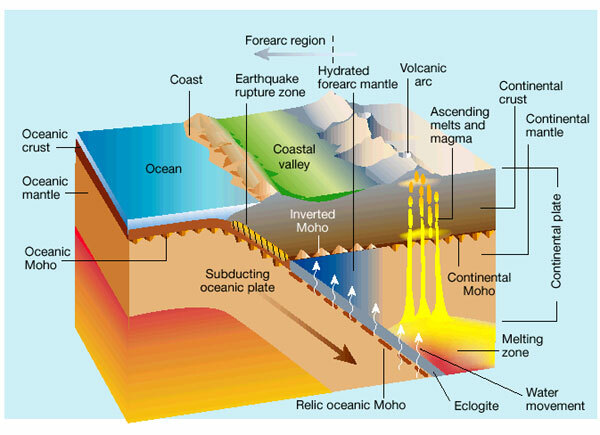 Do ringwoodite minerals point to an “ocean's worth” of water, or a true subterranean ocean? What are the implications of the recent discovery that huge oceans exist close to the mantle of the Earth? How much of Earth's surface would be covered by water if all ice melted?